Be it a hot summer’s night, or any other night of the year, you may be losing sleep for a number of reasons, including hot flushes, night sweats or existing medical conditions – and you are more than fed up of putting up with it. You can toss and turn all night, never getting comfortable, craving to be cool and content. Opening the windows and turning on the fan is often not enough. You’re hot and your partner’s not! This is also a common issue couple’s face, which can lead to one of you being too hot while the other one freezes as a result of the covers been thrown off. The good news is there is something you can do about it. 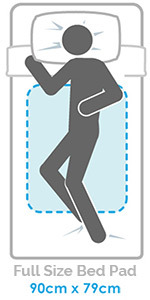 With a cooling mattress protector, you control your temperature – now that makes for a sound night’s sleep all-round! Our new Cooling Gel Pads work by absorbing pressure and heat from your body as the soft gel cools you down, allowing you to achieve a regulated sleeping temperature. The Cooling Gel Pads are made from a comfortable, non-toxic, soft vinyl material, which makes them a perfect addition for those with dust mite allergies or sensitivities. This innovative product doesn’t need electricity or refrigeration as is easily folded and portable. It’s easily wiped clean and it is white in colour to ensure it is discreet and causes as little disruption as possible to your colour coordinated room. How do the Cooling Gel Pads work? The Cooling Gel Pads have been engineered to ensure that nothing else is added to your list of chores, and that getting cool is a quick, easy process, not a tiresome lengthy one! The gel is separated into sections so it is evenly distributed for maximum cooling and comfort. No pre-freezing or refrigeration is required because the cooling gel reacts to your body’s own heat to bring its temperature down a few degrees, while you enjoy the soothing, cooling effect. Can I benefit from the Cooling Gel Pads? The Cooling Gel Pads are also a fantastic accessory for those camping holidays! When suffering from the ‘greenhouse effect’ in your tent it can be pretty uncomfortable, so sleeping or resting on the cooling gel pads can be a godsend – a quick wipe clean and they look brand new again!